A beautiful world scattered and scared by ruins, a silent protagonist, and a vague quest. Hob, on paper, might sound like a very familiar formula, but its nuance and art design really push it apart from the rest of the adventure games. You play a small, child-like robot, who I assume is called Hob, though the lack of dialogue makes it difficult to be sure. Exploring a series of geometric ruins with a hulking, determined robot at your side, the player begins as almost completely defenseless. You are at the mercy of your companion who quickly traverses the environment. But this peaceful tour doesn’t last long, and soon your companion is wounded and you are forced to take the lead. Like a lot of other adventure games, Hob draws a lot of its inspiration from the Castlevania model of gameplay design. Progressing through the game unlocks new abilities that let you discover previously impossible routes. Exploration in Hob is really satisfying, mostly because the game is just beautiful to behold. There are a lot of different collectibles you can search out in the form of butterflies, broken robots and chests, but exploration for the sake of it was my primary motivation. Fantastic animals dot the landscape, structures emerge spectacularly out of the luscious environment. Finding any excuse to retread old paths and find new ones kept me coming back Hob day and night. But the art and environmental design might be slightly too good in Hob because several times I got very lost. The game hints and nudges you into where you should go, but with just a filled landscape to explore, it can be difficult to find the actual route in it all. This hampered my progress at almost every point where I had moved on to a new area. Most of the evolving powers that you acquire allow you to interact with a different object in the world, but identifying them in a vibrant and branching world is difficult. It’s surprising given the developers’ previous titles of procedurally generated dungeon crawlers (Torchlight), that I could hardly find any signposting, subtle or otherwise. Although it does give you the chance enjoy the scenery, it does occasionally ruin the pacing when you spend the good portion of a gaming session hopelessly retracing your steps. And although this issue does resurface itself a few times through the game, especially when you start getting lost on teleporter pads, this is literally the only criticism I have about Hob. Quite simply it is a delight to play. Combat, which isn’t frequent in the first section of the game, is a mix of rolling and initiating a flurry of attacks before dodging away. Enemies are varied and imaginative, from huge beasts swinging hammers to some glowing crabs that hide in the grass. You can buy a selection of upgrades that can complement your style but for the most part, you’ll be sticking to attacks and rolls. Platforming can be a little trickier, with awkward camera angles and curving platforms occasionally tripping you up. You’ll be progressing in every direction, rather than following an obvious corridor which if nothing else lets you get a look at your cute robot avatar. There’s also the obligatory range of simple, familiar puzzles, like moving blocks to reach higher ground and finding switches to turn off deadly traps. Again, at its most basic Hob isn’t anything new, but in its execution, Hob is head and shoulders above other games of the same caliber. Don’t get me wrong, Hob probably isn’t the next Zelda, but it has its own very strong personality and visual, and could easily become a beloved, albeit less popular franchise. The problems you encounter, like getting lost, are uniquely enjoyable in the right mood. You can explore without feeling the need to progress, as long as you know that’s what you’re going in for. The soundtrack is a lovely, simple soundscape. Hob doesn’t offer nearly the same feast for the ears as it does for the eyes, but it is a nice addition to the game that adds to the atmosphere of quiet isolation that grows from the ruins the nature of the title. 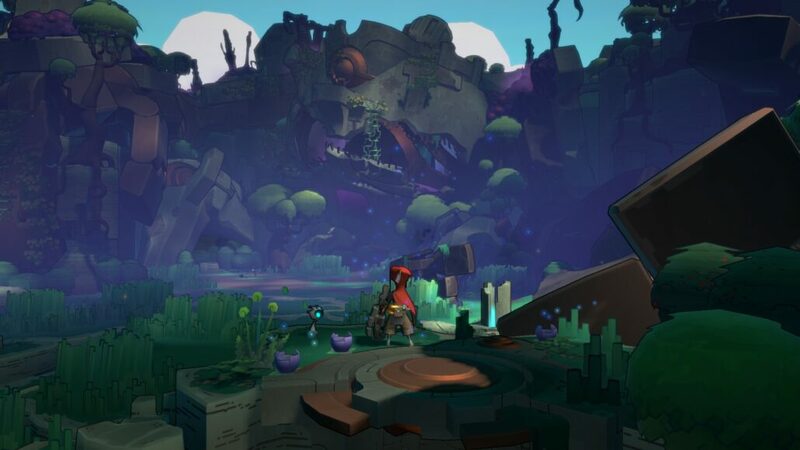 Most games like this normally have technology as the antagonist, with nature rising from, and overcoming the remnants of the last civilization, but Hob even turns this on its head. Playing as a young robot and battling against the beasts of the natural world that has reclaimed the ruins. The narrative is, for the most part, obscured, and there is a certain freshness to playing this side of the fight. Hob is an exceptional game with a really strong idea of what it wants to do. 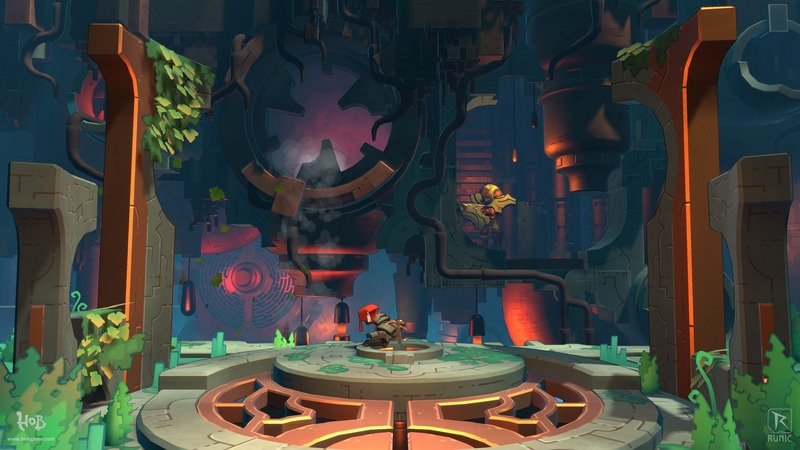 Although there are a few problems and the soundtrack could be more involving, nothing makes Hob feel less. 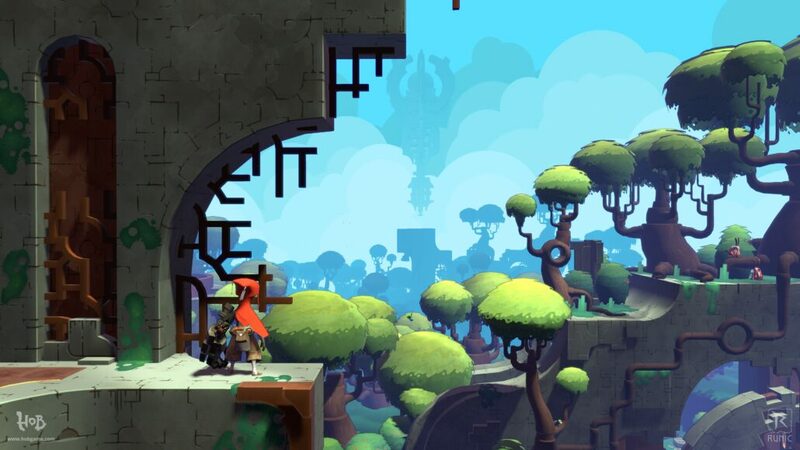 What the developers set out to do with Hob has clearly been fulfilled, making the title so rewarding to play and explore. Reviewed on PlayStation 4 (code provided by the publisher). 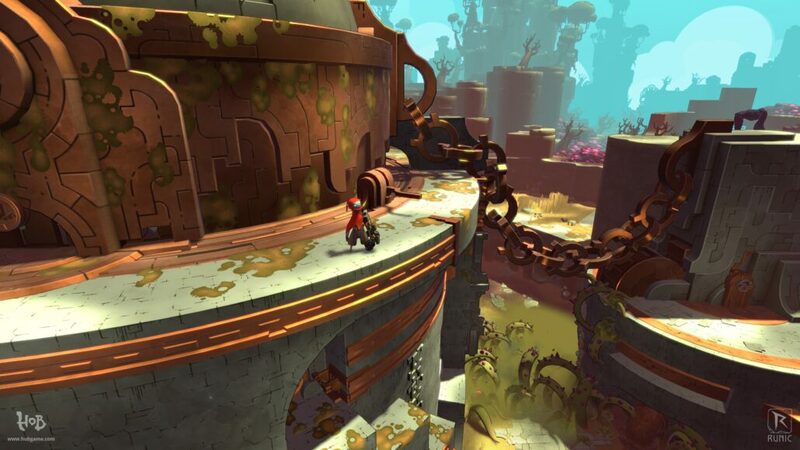 Hob is an action adventure with a stunning visual style, engrossing world and enjoyable combat. It is a standard bearer for what the genre can achieve at this level.